Útúrdúr presents the schedule for Cultural Night. This program is for events both in Útúrdúr and Havarí the store we share a space with. Everybody is welcome. For information in English scroll down. Sigurborg Stefánsdóttir sýnir bókverk og ræðir um verkin sín. Sigurborg vinnur markvist með bókina og eiginleika hennar og hafa bókverk hennar vakið mikla athygli. Sigurborg mun sýna nokkur ný verk og einnig eldri. Just Another Snake Cult er hugarfóstur Þóris Andersen sem hefur dvalið meirihluta ævi sinnar í Santa Cruz og kemur þaðan til Íslands með sækadelíska poppmúsík í farteskinu. Þórir er búinn að setja saman fjögurra manna hljómsveit til að leika tónlistina og eru þetta fyrstu tónleikar sveitarinnar í Havarí á menningarnótt. Sækó spennó! Útgáfa á bókinni YOU HAVE HAIR LIKE FLAGS, FLAGS THAT POINT IN MANY DIRECTIONS AT ONCE BUT CANNOT PINPOINT LAND WHEN LOST AT SEA eftir Alisha Piercy. Þetta er hennar önnur bók og vann hún nýlega til virtra verðlauna bpNichol 2010 Chapbook Poetry Award fyrir verk skrifuð á ensku í Canada. Sérstök íslensk útgáfa af bókinni hefur verið gerð og mun Alisha Piercy lesa upp úr verkinu klukkan 22:00-23:00 í Útúrdúr. Gjörningurinn TWENTY-TWO RAFTS ALIGHT mun fylgja á eftir útgáfunni. Gjörningurinn er samstarfsverkefni milli Íslenska listamannsins Óskar Ericsson og Kanadíska rithöfundarins og listakonunar Alisha Piercy, en bókin hennar YOU HAVE HAIR LIKE FLAGS~ er innblástur að verkinu. Gjörningurinn mun eiga sér stað klukkan 23:30 við Sæbraut. Að auki mun skúta sýna verk sitt "All Icelanders" í Útúrdúr á Menningarnótt. Verkinu verður varpað á vegg í Veltusundi en nánari tímasetning verður auglýst síðar. All Icelanders er hluti af verkinu 52/52+ Books/Weeks eftir Helga Skúta. 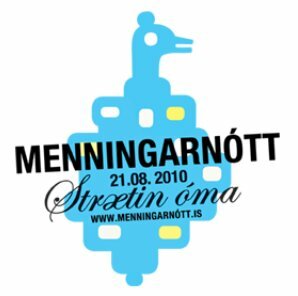 Síðast en ekki síst vekjum við athygli á Veggspjaldi vikunnar. Hildigunnur Birgisdóttir er listamaðurinn í 21. viku verkefnisins og sem fyrr er veggspjaldið prentað í 21 eintaki nema Hildigunnur hefur farið inn á nýtt torg með veggspjald vikunnar á tímum fjöldaframleiðslunnar með því að gera hvert eintak einstakt. Sigurborg Stefánsdóttir is an Icelandic artist who will exhibit new artistbooks and talk about her works. Sigurborg’s art has recieved much attention and in her works she experiments with the aspects of the bookform. Just Another Snake Cult is the creation of Þórir Andersen who has lived most of his life in Santa Cruz. He came to Iceland loaded with his psychadelic pop music and has put together a four man band to perform his music. This will be the first concert that the band plays. What a thrill!! Of Monsters and Men are the winners of Musicexperiments 2010 and certainly deserve to carry the title. The band members are Nanna Bryndís Hilmarsdóttir, Ragnar Þórhallson, Brynjar Leifsson and Arnar Rósenkranz Himarsson and they play undescribably beautiful indie music like a smoking pie in the window. Publication of the book YOU HAVE HAIR LIKE FLAGS, FLAGS THAT POINT IN MANY DIRECTIONS AT ONCE BUT CANNOT PINPOINT LAND WHEN LOST AT SEA by Alisha Piercy and a book reading. The chapbook YOU HAVE HAIR LIKE FLAGS~ is Alisha Piercy´s second book, and was recently the winner of the prestigious bpNichol 2010 Chapbook Poetry Award for the best chapbook of poetry published in English in Canada. A special Icelandic version of the book will be made for this occasion. The performance TWENTY-TWO RAFTS ALIGHT will follow the book launch. The performance is a collaboration between the Canadian writer and artist Alisha Piercy and Icelandic artist Óskar Ericsson. The performance is inspired by the book YOU HAVE HAIR LIKE FLAGS, FLAGS THAT POINT IN MANY DIRECTIONS AT ONCE BUT CANNOT PINPOINT LAND WHEN LOST AT SEA. The performance will take place at Sæbraut at 23:30.
skúta will also show his work “All Icelanders” in Útúrdúr. The piece is part of his project 52/52+ Books/Weeks. Further information about this event will be announced later. Last but not least we want to shine the spotlight on the Poster of the Week. Hildigunnur Birgisdóttir is the artist behind the Poster on the 21st week and as before the Poster is printed in 21 numbered copy’s but this time with a twist. In the time of mechanical reproduction Hildigunnur Birgisdóttir decided to make each copy unique. On Cultural Night everybody is welcome in Havarí and Útúrdúr as all nights.